The other morning while I was practicing at my piano, I had a thought, “I know my students love the piano, but do they know how the piano came to be?? ?” That inspired me to sit down and write a quick little article about the fascinating history of the piano. Now, not only will you love playing this wonderful instrument, but you’ll also have a much deeper appreciation for it! For centuries and centuries, people have known that a string, if stretched tightly and then plucked, would make a sound. This led to people stretching string over bows, gourds, boxes, etc. to increase the volume of the string when played. Around the Middle Ages, someone had the clever idea to combine these stretched strings with keys. This led to the invention of the dulcimer in the 14th century (you can find a picture of each of these instruments by clicking each word), which evolved into the clavichord, spinet, virginal, clavecion, gravicembalo, and eventually, the harpsichord around the 15th century. The problem with the harpsichord, however, is that it only had one volume. Wanting a way to be more expressive, a harpsichord maker by the name of Bartolomeo di Francesco Cristofori created the earliest version of the piano, which he presented to the public for the first time in Florence in 1709. 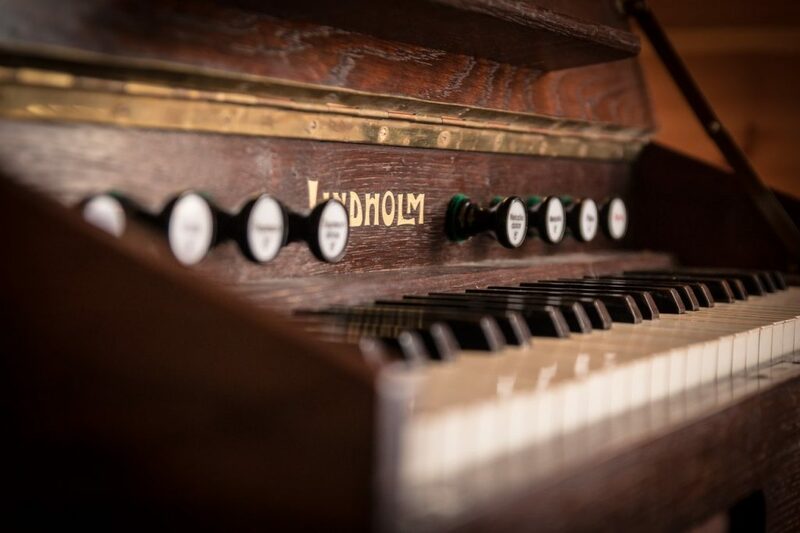 This early version of the piano was first named gravicembalo col piano e forte, which can be roughly translated to “soft and loud keyboard instrument,” as this version finally allowed musicians to create varying degrees of volume. It turns out, the pianos we play today are still pretty similar in look and design to the one Cristofori invented in 1709! Pretty fascinating! Thanks Cristofori for creating such a beautiful and awesome instrument. P.S. Curious about how my piano method can help you finally learn how to play this fascinating instrument? Click the button below to be enrolled for free in my intro course. Thanks. Scott. Do you know who developed the system of musical notation used today? The Clavichord wasn’t a precursor to the Harpsichord. It is more similar to a piano – small metal blades actually strike a double string, similar to a piano, but unlike a piano, the blade doesn’t rebound but stays in contact with the string. They are not very loud, but you can vary the loudness or softness of the volume a bit. I was given access to one in the Smithsonian. I’ve been looking for a good coffee table book about the history of the piano and how it came to be. Scott, I have always wanted to play the Piano. I took lessons as a child. I seem to get so far and can’t go any further. I am 77 years old and I still want to learn to play gospel songs for my own enjoyment. My husband tells me that I will never learn to play. Can we prove him wrong or am I a hopeless case? I am determined and I have the willpower! How much does this course cost? Interesting news letters – Thank you for your efforts to bring this information to us on the computer. Love the images of the early instruments. thanks Scott and team for an interesting reflection on how the piano evolved to the instrument we know today. Of course we could extend the development to include some of the latter enhancements such as electric and electronic instruments. The great thing is they each still require the same basic skills and techniques to play. Who knows there may be more to come. anything I pick up, with a ton of practice. Thank you for all the information you furnish. I am pushing 65 years of age. I have never played piano or learned how to read music. In three weeks I could do both ! I invested in Scott’s Prgramme and it suits my learning style. I’ll never be a virtuoso but I will be satisfied if I can play a few tunes for fun and singalong. Hi, Scott, First, I have to thank you. Without knowing you, I won’t play piano at all and will sale our piano because of no one play at the house. I sent my daughter and son learning play piano since they are 6 years old. Now they have grown up and move to other states. I am 70 years old. I will learn from you until I can play. Thanks again.